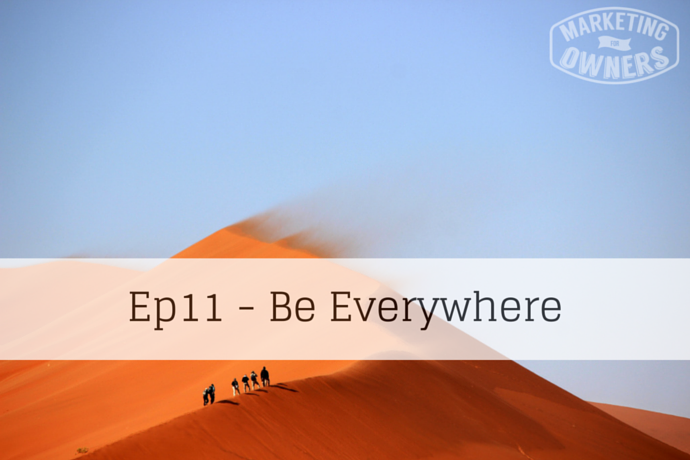 Be everywhere, why? Well, because your customers are everywhere. Or, more importantly, your potential customers are everywhere. Of course, when I say “everywhere”, they’re not everywhere at once, but they use multiple platforms. Multiple places to spend their spare time or to look for information. In the old days we just had good old Yellow Pages and things like that. So it was simple. You had magazines and there was no online so without all the multiple platforms. Take social media for instance, you’ve got Twitter, you have Facebook, Google Plus, LinkedIn, Pinterest, Instagram, the short six second Vine videos. There are YouTube videos. Then you can have videos on Viddler, Vimeo, Wistia, I already mentioned Vine, and Instagram videos, you can put videos on Facebook. Then there’s the new Ello. They’re coming out all of the time and that doesn’t include podcasts. I mean this podcast is on iTunes and it’s also on Stitcher Radio. Now, personally, I’m not a user of Stitcher Radio, but people in their droves use Stitcher Radio everyday so the podcast is posted there as well. You don’t have to be using these things everyday all day because there’s only 24 hours in a day. But you can pick the ones that are going to work for you. You should try everything at least once. Get a profile. List yourself. Get someone to do it. There are actually services that would do this for you and, of course, online you get access to everything, but get yourself on the places. For example I mentioned Vine. Now personally I’m too old to get Vine. I don’t understand it but people use it, there are kids they are with millions of followers. You’ve got Coca Cola paying them to sponsor things because that’s where the young are today. It doesn’t matter whether you get it or whether you use it, people are using it. And if it’s their platform of choice, if it’s where they spend their leisure time then they’re quite often going to spend their work time there as well, so you need to be there. This is a multichannel society and you can’t decide where your followers are going to be, you just need to be where they are. 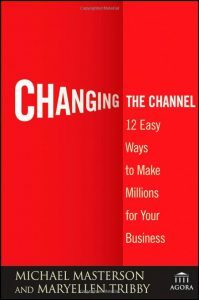 Now Monday, it means book of the week and coincidentally we’re going to recommend “Changing The Channel”. This is by my good friend MaryEllen Tribby and her colleague Michael Masterson. He’s actually a bit of a genius and will get another book mentioned in a few weeks. They come from a direct mail and sales background, and they discuss the way that you can use multiple channels these days to get to everyone and how you can use it. Good examples, how it’s worked for them, how it’s worked for others. So, I recommend reading that book, it’s very apt. As always, this Monday episode is sponsored by the good folk at Rainmaker. Otherwise have yourself a good Monday, prepare for the week go have a look at that book and I’ll see you tomorrow.